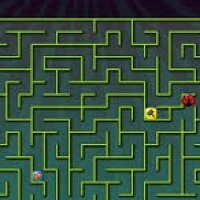 Pacman Rush is classic maze game. The aim of the game is to guide Pacman around the maze and eat all of the black dots & avoid getting caught by the ghosts. You can eat the bonus food for extra points and eat the fruits around the maze to get super powers, at which point you can also eat the ghosts. You have 3 lives and 9 levels.Much fun!This game is really interesting game for you!Join now and have fun!